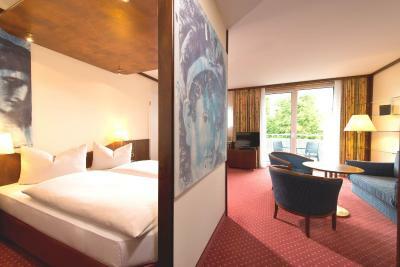 Lock in a great price for Living Hotel Weißensee by Derag – rated 8.7 by recent guests! 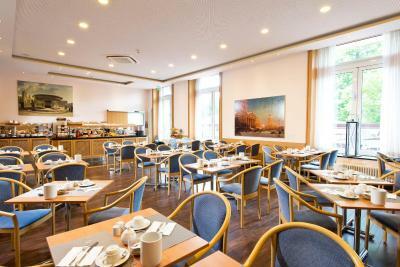 The hotel is located next to the beautiful lake Weissensee, within a very quiet, park-like area. The staff was incredibly friendly and welcoming, they even provided bowls and a chewing toy for my furry company. Also, the kitchenette in the room and the free water and beer made my stay extremely pleasant! The hotel is eager to be green, you can opt out of the daily towel-exchange and they provide soap dispensers except the small plastic packages. Oh and did I mention the brand new spa? The sauna and facilities were amazing. 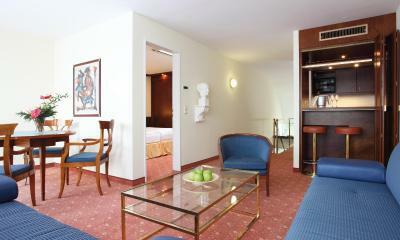 Really nice hotel and my favourite for Berlin now. 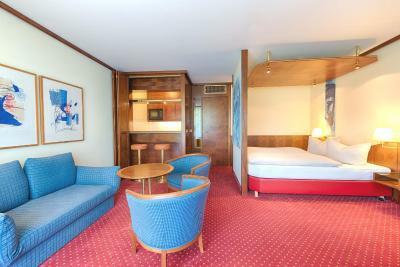 Room is perfect - the biggest room for one person I have ever was, and with balcony. They have free water and even bier in fridge (small note for people come from Bayern - Berlin bier :))! 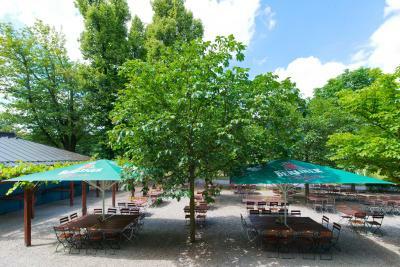 And they have biergarten on summer season - good option to eat with reasonable price. Breakfast is good, you can book it. I do not have strong opinion about location. It is far away from subway. 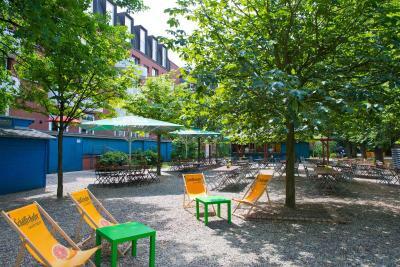 There is tram but still it is far from city center, but this area is really quiet and comfortable and close to my favourite Prenzlauer Berg. So, I can recommend it. Enjoyed being in a quiet area on the outskirts of Berlin. 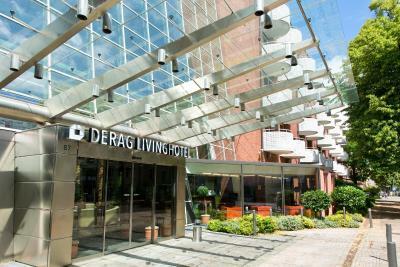 Travelling with my husband and our 18-year-old son, it was great to have a spacious, two-storey "apartment" at the Living Hotel Derag, including a full bathroom upstairs, a loft with desk and a powder room adjacent to the small, well-equipped kitchenette and living room (set as the sleeping area for our son). 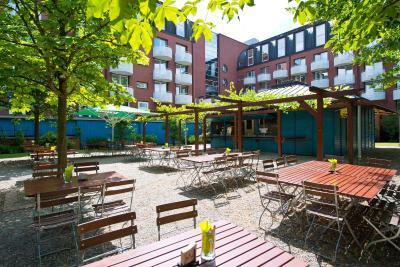 The beer garden behind the hotel was a bonus and closes at 10 pm so noise is not an issue. We bought a day pass for 9 Euros each that gave us unlimited use of transit (bus, tram, subway) for the day - good til 3 am! A 15-20 minute tram ride takes you to the heart of the city. Nice to have A/C during August heatwave - though it wasn't quite as powerful as what we're used to in North America (we are so spoiled!). 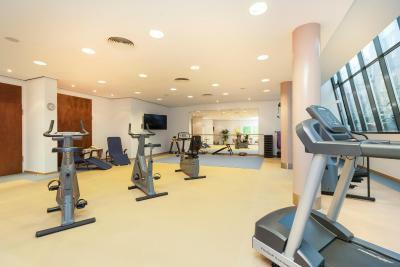 Gym was spacious and adequate if not the most up-to-date equipment. Sauna and laundry facilities were a bonus! Excellent value for money. I'd return. I just loved the hotel; the location, the room, the interior decor, the wonderful breakfast with a calm and pleasant atmosphere..just everything was absolutely delightful. The food was great at breakfast. Also, the hotel staff was very friendly and helpful. Very comfortable hotel, not far away from center. Near hotel is park (first what you hear in the morning - birds singing). Hotel has very good furnishing. Everything is clean and good quality. Personal are helpful and speak in English. I can recommend this hotel. The room isn't new but comfy and peasant. 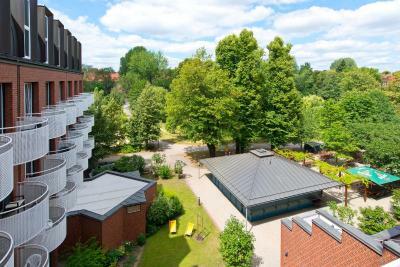 It's situated a little bit far from city center, but there is a tram stop (Tram M4) in walking distance, so you can get to the city center in 15 minutes. 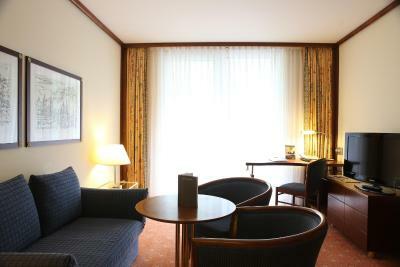 The room is big (25-30 sq.m.) and quiet. Mattresses and pillows very comfortable. Bathroom clean and hot water not from the boiler, so you can take a long shower. 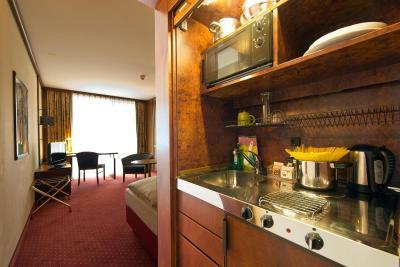 There is a kitchenette in the room - microwave, fridge, kettle, all you need. Also free water and beer in the fridge. Wifi was good enough for youtube. The best thing for me was a smartphone with internet! You can take it with you, and you'll never get lost! 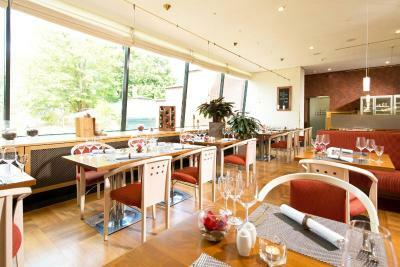 This hotel is located 2 mins away from Weißensee lake - perfect spot to run! It is nice, clean, stuff is friendly. Sauna works every day after 4 pm and it’s not too busy. 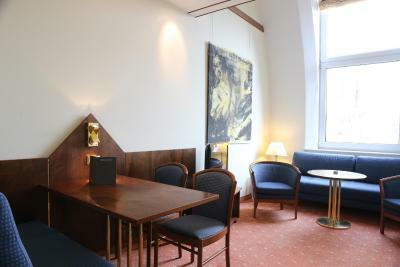 Overall a nice place to stay in Berlin even so it’s quite far off the main city attractions. There is a small kitchen in the room with everything you need. 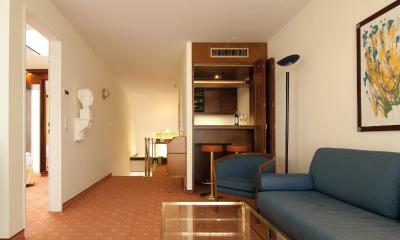 Minibar is without extra price (2 drinks, 1 whater and 1bier per person per day). Very clean and comfortable. The room had also a balcony. Nice park with lake just in front. 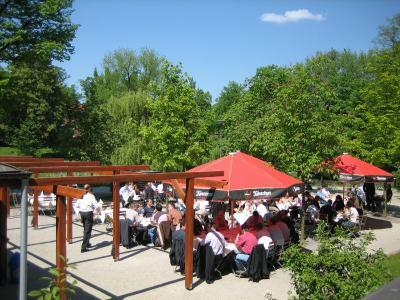 There are also good restaurants near i.e. cuban, indian etc. Good connection to city centre by tram. Parking is not easy but still possible on the streets around (take care in front of the hotel, we got a ticket in 5 min 😑). I was pleased to stay there. 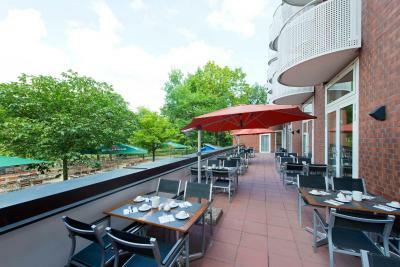 Living Hotel Weißensee by Derag This rating is a reflection of how the property compares to the industry standard when it comes to price, facilities and services available. It's based on a self-evaluation by the property. Use this rating to help choose your stay! 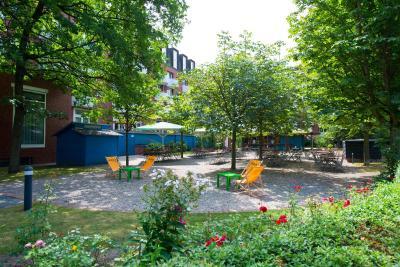 One of our top picks in Berlin.This hotel offers a peaceful park setting in Berlin’s Weißensee district, a direct tram ride from Alexanderplatz. 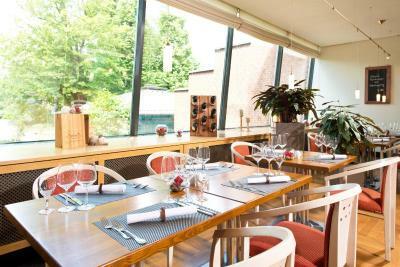 It features modern rooms with free mini-bar, and a restaurant with beer garden. 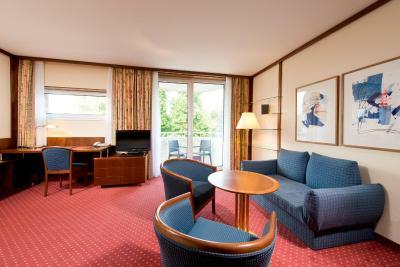 The air-conditioned rooms at the 4-star Derag Livinghotel Weißensee include satellite TV. 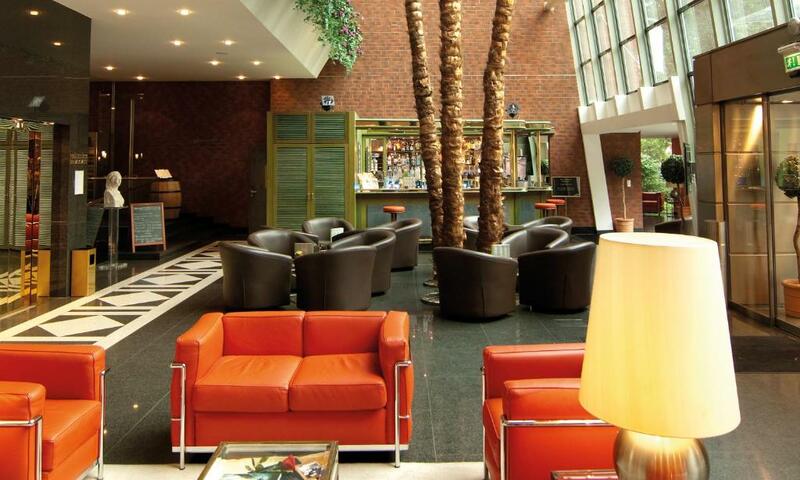 Some have a balcony, microwave and kettle, and selected drinks in the mini-bar are free. 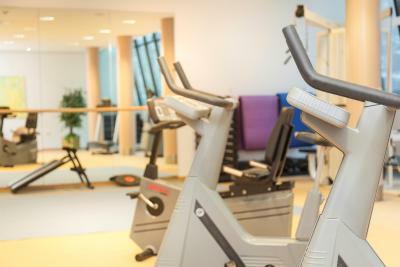 Living Hotel Weißensee by Derag features a modern fitness center with gym, sauna and infrared sauna. 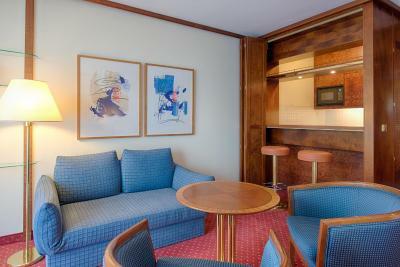 Bathrobes and towels are provided, and massages can be booked. The Albertinenstraße tram stop is a 10-minute walk away. From here, trams run to the famous Berlin TV Tower at Alexanderplatz in 15 minutes. 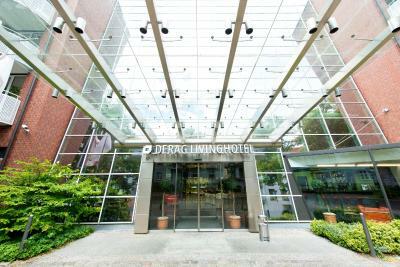 When would you like to stay at Living Hotel Weißensee by Derag? 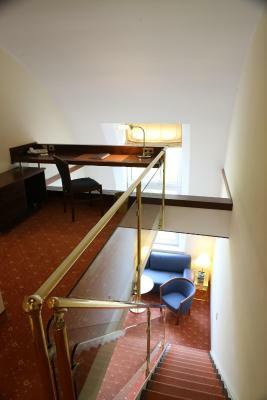 This double room features a large double bed or two single beds, air conditioning, a mini-bar, coffee and tea facilities, a TV, a safe, a trousers press and a bathroom with bathtub and hairdryer. It faces the street or courtyard. Some rooms offer a balcony. 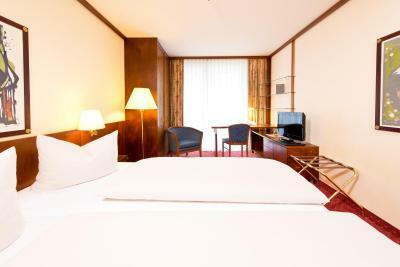 This single room features air conditioning, a mini-bar, coffee and tea facilities, a TV, a safe, trousers press and a bathroom with bathtub and hairdryer. It faces the street or courtyard. 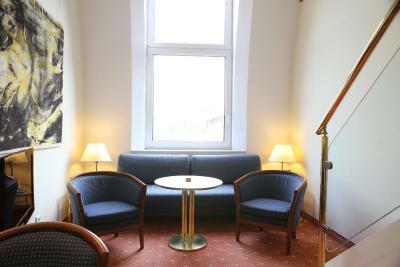 This single apartment features a single bed, air conditioning, free WiFi, a kitchenette, coffee and tea making facilities, TV, safe, trousers press, and a bathroom with with bathtub and hairdryer. The apartment faces the street or courtyard. It is cleaned twice a week. This apartment features a double bed, a balcony, air conditioning, coffee and tea facilities, free WiFi, a TV, a safe, trousers press and a bathroom with bathtub and hairdryer. It faces the street or courtyard. It is cleaned twice a week. 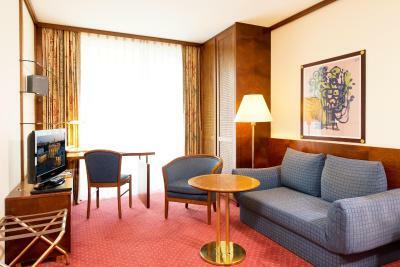 This business double room features a double bed, a balcony, air conditioning, a mini-bar, coffee and tea facilities, TV, a safe, trousers press and a bathroom with bathtub and hairdryer. It faces the street or courtyard. This family apartment comes with a roof terrace, a separate living and sleeping area, a sofa bed, air conditioning, a kitchenette, coffee and tea facilities, a TV, a safe, trousers press and a bathroom with bathtub and hairdryer. 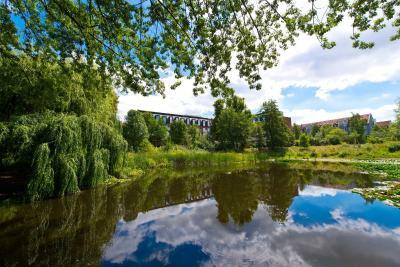 Only a 20 minutes by public transport away from Berlin-Mitte the 4-Star Derag Livinghotel Weissensee is nicely located in the middle of a park complex - for those prefer a stay out of the city bustle. 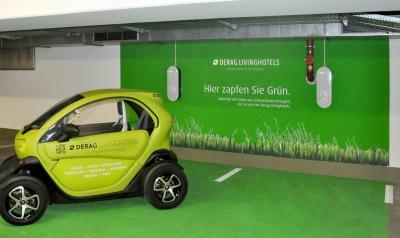 House Rules Living Hotel Weißensee by Derag takes special requests – add in the next step! 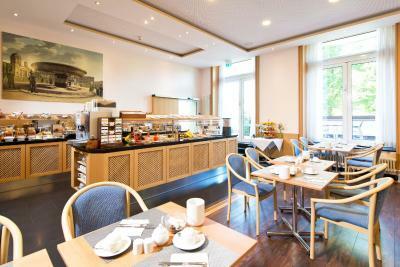 Living Hotel Weißensee by Derag accepts these cards and reserves the right to temporarily hold an amount prior to arrival. 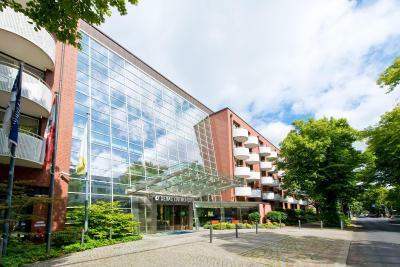 Please note that there are many streets called 'Parkstraße' in Berlin and this hotel is located in the north-east Berlin district of Weißensee (postal code 13086). Quiet area, will keypt and clean. Air conditioner was a little bit noisy, i had to turn it off while sleeping. Kitchen compartment in the room is useful. I really liked the balcony. People at the hotel was very nice. 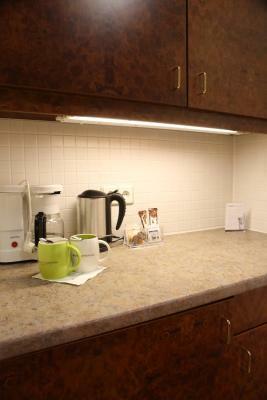 The room was well equipped with microwave, refrigerator and kitchen stuff. And it was nice to get into the room and find a bottle of free beer and water for each person everyday. The hotel was 10 minutes away from the tram, so we could get anywhere by public transportation. Rude staff and shocking customer service, not everyone to be fair, but in definitely spoiled my stay. Simple, yet effective Clean spacious rooms. Nothing fancy but great value for money. Very good breakfast. 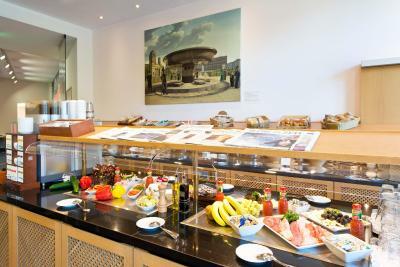 Apart from the bread, salads and helpful staff, breakfast was rather mediocre. The room was overheated, and lowering the temperature at the thermostat had no effect. It is far from the centre. 8 minutes to walk to the tram stop, then 15 minutes to Alexanderplatz. During my stay, part of the line was under construction, and the need to take a replacement bus increased the trip by 15 minutes. The flat surface in the bathtub was potentially slippery and dangerous. Staff was friendly, helpful, reliable. Bread and salads were good at breakfast. The hotel was very quiet. Good exercise room. The neighborhood was quiet, very pleasant, old residential Berlin. Good historic pictures of it in hallways in the hotel. The beautiful building and the overall atmosphere impressed me most. Lack of beer glasses. We would have liked two beer glasses to accompany the two wine glasses. Plus face flannels , though these were supplied on request. Helpful staff. Flexibility of having somewhere comfortable to spend the day, when we did not feel like going out. It would have been nice if they allowed swimwear in the sauna. 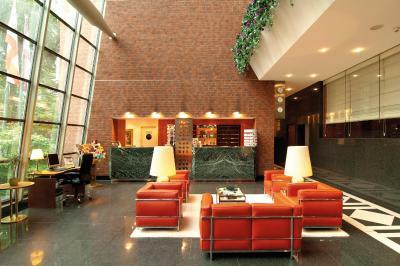 The staff was very nice, and I was allowed to check in several hours before the official check in time. 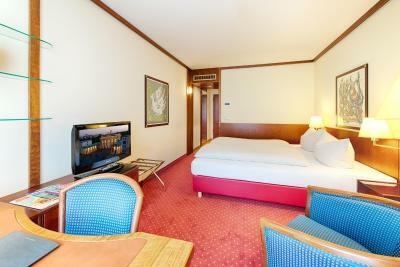 The room was clean and of a good size with nice facilities. 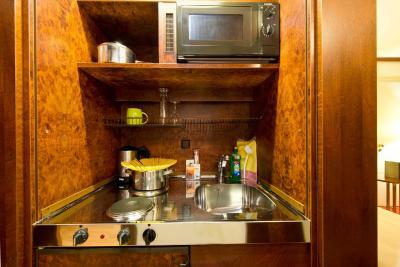 The kitchenette was quite well equipped and we liked how they left bottles of water and beer in the mini bar every day. We didn't had slippers and I expected those to be included being a ****hotel. 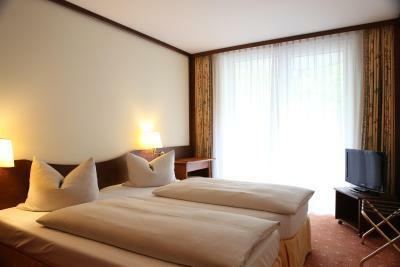 The room was very nice and clean, the bad and pillows were comfortable. I liked that we had a balcony, a kitchenette and even free water and beer in the fridge.